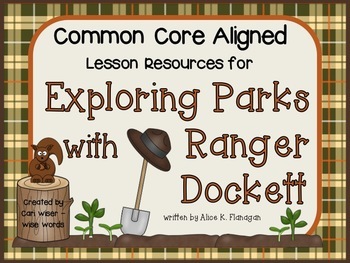 Explore the possibilities of the Common Core with everyone's favorite park ranger! Here are 14 resources to help you and your littles appreciate the special message this piece of nonfiction text brings! The first 7 items focus on some aspect of working with and having a greater understanding of WORDS. A staple to the unit is a list of Tier 2 vocabulary words with scaffolding to support the production of complete sentences. A larger vocabulary is the #1 key to success for students! Working hand in hand with the Tier 2 vocabulary are the high frequency sight words that students need to know when reading Exploring Parks with Ranger Dockett. Word recognition is stressed with the goal of reading text with sufficient accuracy and fluency to support comprehension. This is a parent-friendly homework that gives extra practice time for sight words. 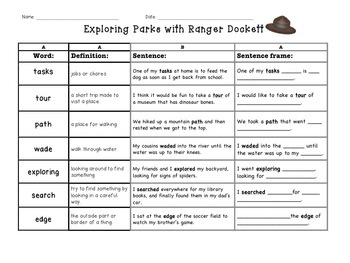 Here is an organizer page for each of five multiple-meaning words found in Exploring Parks with Ranger Dockett. The first meaning recorded comes directly from the story, and then students have the opportunity to explore a 2nd or 3rd meaning. Active dictionary skills are included in the Common Core, and this is a perfect place to begin developing them! There are 5 compound words in the text that can be analyzed for their base word meanings. The grow list organizer makes this easy and meaningful. The author describes the parks as “special green places in the heart of the city”. 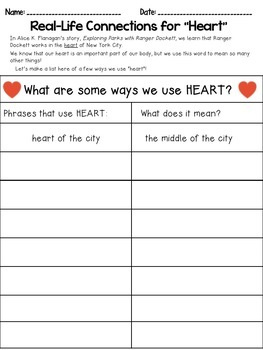 Here is an easy way to get to the heart of the matter as you discuss various phrases containing the word heart! A list of ideas is included! It all starts with the kids in the park looking for turtles, frogs, and insects. This organizer will give your kiddos the opportunity to find great synonyms for “look”- everything from a long “stare” to a fleeting “glance”! Suggested words with their meaning differences is included! The next 4 items focus on story elements and comprehension. These questions dig deep into discerning the author’s message, reasons for word choices, comprehension, and even poetic devices! Here is a resource that you will be able to use with any piece of literature- even poetry! 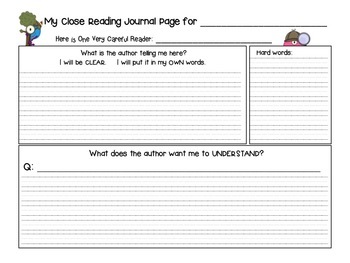 Close reading techniques begin in the primary classroom. The posters list questions that will make it easier for you to guide your readers to a deeper understanding of the text. The journal pages break the process down into simple, bite-sized pieces. Short constructed response is an element that will be part of the new standardized testing norm. These text-dependent questions are an easy way to make this a part of your routine. This 6-question test contains 4 multiple choice and 2 short response questions. Students will become more familiar with some of the new Common Core testing formats, like having more than one correct answer on a multiple-choice question! Here are 4 resources to guide your littles through the writing process! Ranger Dockett knew what he was doing when he made sure that everyone followed the rules to make the parks safe places. Here your littles will have the opportunity to share what they know about staying safe! This organizer supports the prewriting phase of the writing process. It gives students the scaffolding necessary to organize their thoughts logically. Divided into sections, it helps guide students to begin with an introduction of their topic and wrap things up with a conclusion. A printable page where students can copy their final draft for display. And now for some fun stuff! Students will enjoy going outside and recording the signs of life they spy within a bit of earth. (Hula-hoop not required as a circle of yarn or twine works just as well!) Writing activity accompanies the observation piece. A simple craftivity for exploring digital resources and being green! Ranger Dockett cares for and loves our planet. Our kids can learn about ways to make our world a greener place! Their pledges to be green will “leaf out” a special green space in your classroom! If you teach this story, please don't miss the preview! Thank you so much for checking out my product!